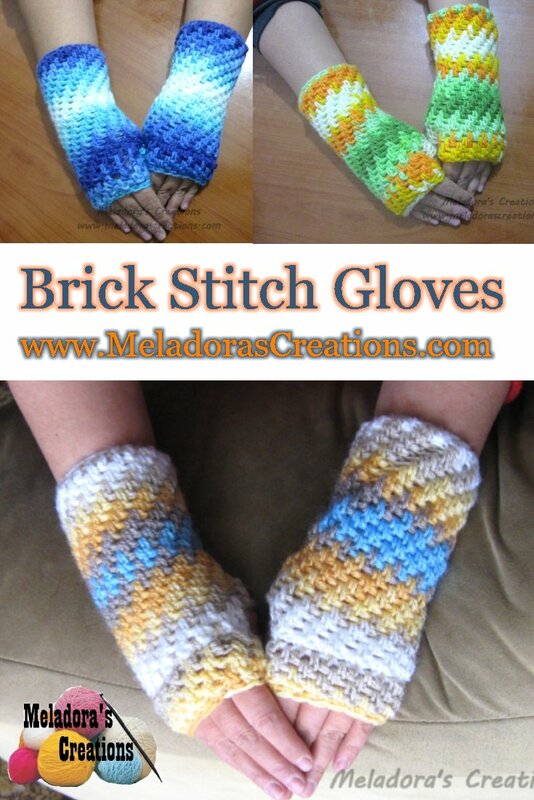 This Free Crochet pattern teaches you how to make crocheted Fingerless gloves using the Thick Mesh / Brick stitch for crochet. 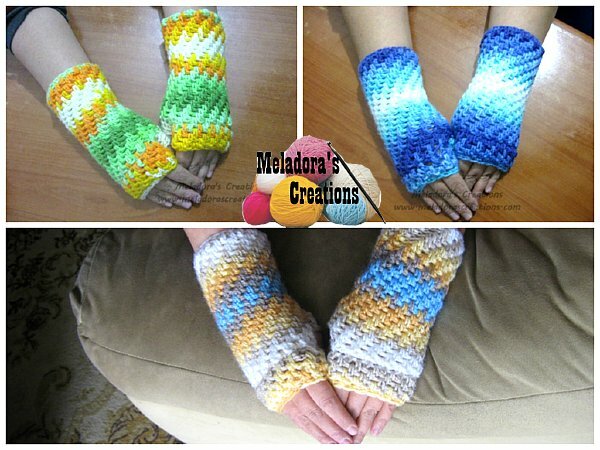 These are warmer and tight to fit keeping your hands very warm where it’s covered. ch 24, sl st in beginning ch to form a ring. 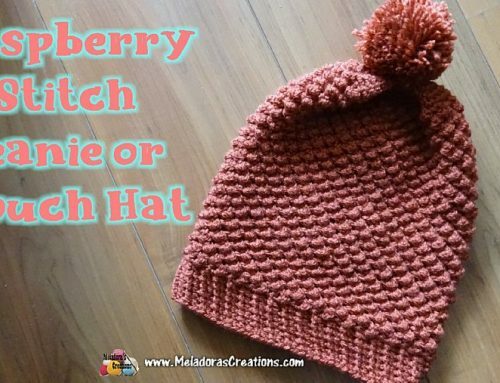 This stitch is done in multiples of 2 of adjust it to the size you like. ch 3, sk a st * dc, ch 1, sk a st * repeat. Sl st in the ch 2 of the ch 3 beginning ch. ch 1 and (working to the right ) dc working two rounds down next to the dc from round 3, ch 1. 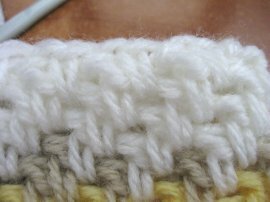 Then working left again, *dc two rows down in the skipped stitch one round down, ch 1. * repeat. There is no need to ch 1 after the last dc of the round just sl st in the top of the beginning dc. repeat round 4 until you have 25 total rounds. 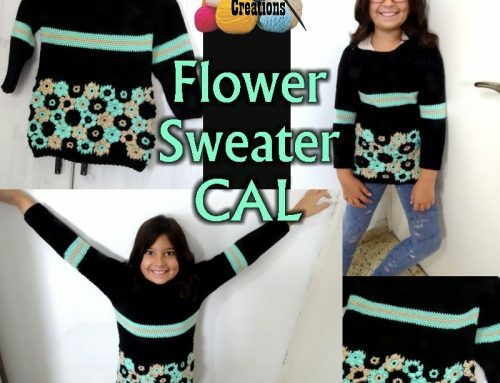 Then you’re ready to start the thumb. ch 5, ( child ch 3, men ch 6 ) sk a st, and dc, ch 1, as normal, two rows down and continue row as normal until you reach beginning of thumb again. sc in all five chains and sc in dc as well, ch 1 and *dc two rows down in the skipped stitch one round down, ch 1. * repeat. 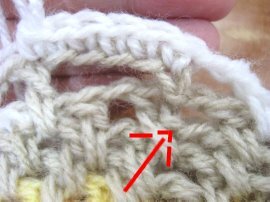 Make sure to dc in the stitch two rows down before the thumb as well. sc dec 3 times, ch 1, (child dec twice, men dec 4 times) *dc two rows down in the skipped stitch one round down, ch 1. * repeat until you reach beginning of thumb again. sc in first 5 sts, ch 1 & sc, ch 1 in all sts around. 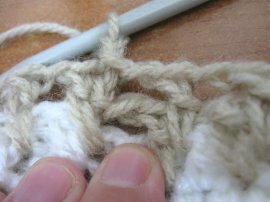 Make sure you do your single crochets loosely here or your gloves will be a bit tight. 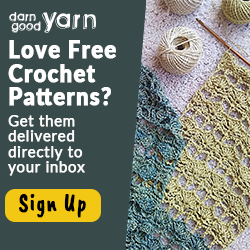 Your using the same stitches that you usually double crocheted in last rounds, but this time you are doing single crochets instead to close the gap. There is no need to ch 1 after the last sc of the round just sl st in the top of the beginning sc. 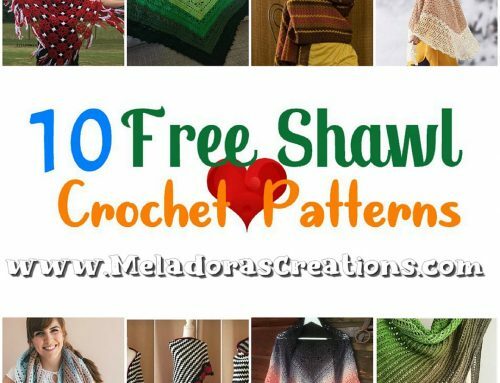 ch 3, sk a st * dc in next stitch, ch 1 * repeat. 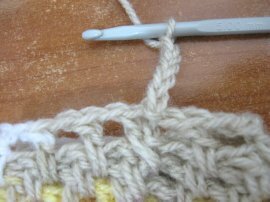 It’s okay if at the end of this round you have two sts to skip, Sl st in the ch 2 of the beginning ch 3.
working as before, ch 1, (working to the right) dc in the skipped stitch one row down, ch 1, *dc one row down in the skipped stitch one round down, ch 1. * repeat. There is no need to ch 1 after the last dc of the round just sl st in the top of the beginning dc. working right for first st, ch 1 and (working to the right ) dc working two rounds down next to the dc from round 3, ch 1. 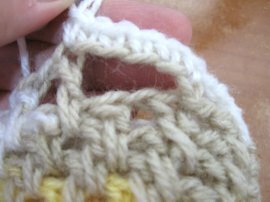 Then working left again, *dc two rows down in the skipped stitch one round down, ch 1. * repeat. There is no need to ch 1 after the last dc of the round just sl st in the top of the beginning dc. You will be doing the same as round 33 only this time SC, ch 1 instead of DC’s. ch 1, sc dec until you get 15 sts. Then sc in rest of sts. This is make the glove snug against you fingers. If it’s getting to tight, then don’t decrease as much. Your choice.